Trefaldighetkören Christianstad has been under the same conductor for more than 30 years. Under that time the choir has been known as “Trefaldighetskyrkans kör” (Trefaldighet=Trinity, Kyrka=Church , Kör= Choir). 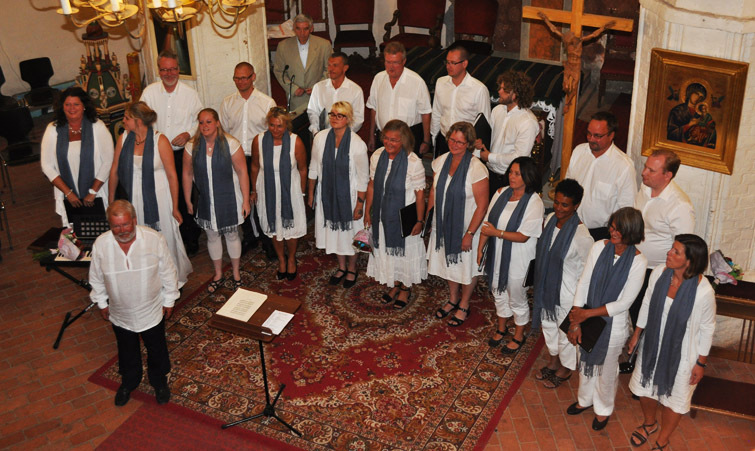 The choir has 20 members, and has a wide operation both in sweden and abroad. We have also sung on several live christian servicies on TV and radio. We were invited to Denmark and an international Bachchoirfesitval some years ago. In the summer of 2010 we got an invitiation to sing the swedish baroque composer J.H. Roman’s “The Swedish mass” together with Koszalin’s Philharmonic Orchestra in Poland. This invitation we couldnt decline, so we had a marvelous concert in the Cathedral in the same city. Two days afterwards we also conducted an accepella concert in a old church in the coastcity of Darłowo. The Choir has also made the first performance of the German composer Erich Stoffer’s Requiem a cappella which has a playtime of aprox. 45 min. Trefaldighetskören’s reportoire includes evertything from Gregorian hymns to newly composed choir music like the Swedish composer Fredrik Sixten’s “A Swedish St. Mark Passion”. Johann Sebastian Bachs music and his great works like the Great Mass in B-Minor, St. John/St. Matthews passion and the Christmas Oratio is something that the choir really likes to perform. Since 1988 the choir has has a closely co-operation with a professional baroque orchestra, Wasa Barock. Trefaldighetskören has made several trips to Germany, Holland, Czech Republic, Slovakia, Poland and Denmark. At the end of 2012 the choir was converted to freestanding choir outside the church, we also changed the name to “Trefaldighetskören Christianstad”. The reason for writing Christianstad with a CH and not K (which is the correct spelling today) is to highlight the historic spelling after the Danish king Christian IV.